Edit - Apparently this decided to post without the photo. This is the updated version, with the photo! I've really been loving my Revlon lip products since the release of the new lip butter line last year. They're just so easy to use! It seems just lately a number of brands are jumping on the 'chubby stick' band wagon and releasing lip products in an easy to use thick pencil. Even better is they don't need sharpening, you just wind them up! I didn't have any intention of trying these till my cousin showed me this one as she'd bought it and really rated it. I just had to try it. I absolutely adore this! 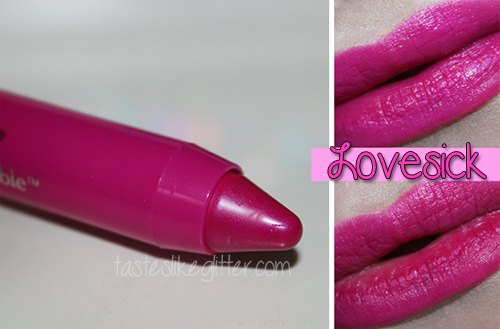 I thought it might be similar to Lollipop lip butter as it's a bright fuchsia pink. This is lighter and bright and has very fine purple and pink shimmer. It also has a refreshing minty scent to it, which makes a change from the regular sweet scents. The first photo is freshly applied. The second is 5 hours later after eating and lots of drinking. This really holds up when drinking and eating. I was apprehensive about how they would stand up to those task as they feel quite glossy on the lips when applied. But I had a drink quite soon after applying and noticed there was a lip print on the glass but it barely any of the colour had transfered. After 5 hours my lips were completely dry but the colour had stained. If you suffer from dry lips it might be best to apply a lip balm over the top of the stain after a couple of hours as I found it could be quite drying at this point. The deeper colours of the lip stains probably hold up better than the lighter ones. I have quite pigmented lips and I couldn't see the lighter ones doing anything to my lips if I'm honest. But this is a fab shade and I'm really happy with my purchase. These are a steal compared to the Clinque Chubby Sticks at just half the price!